A member of the pea family (Fabaceae). A perennial shrub 6-10 ft tall. 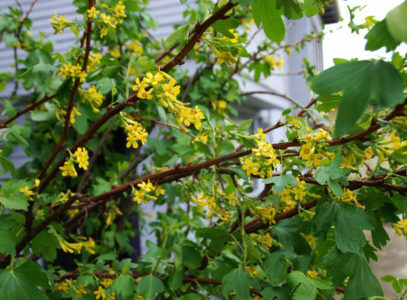 Sharply angled branches with 5 green ridges on them when young, which fall off as the branches mature. One or two golden yellow pea-like flowers cluster between the leaf base and stem. Pods have hairs only along the seams. 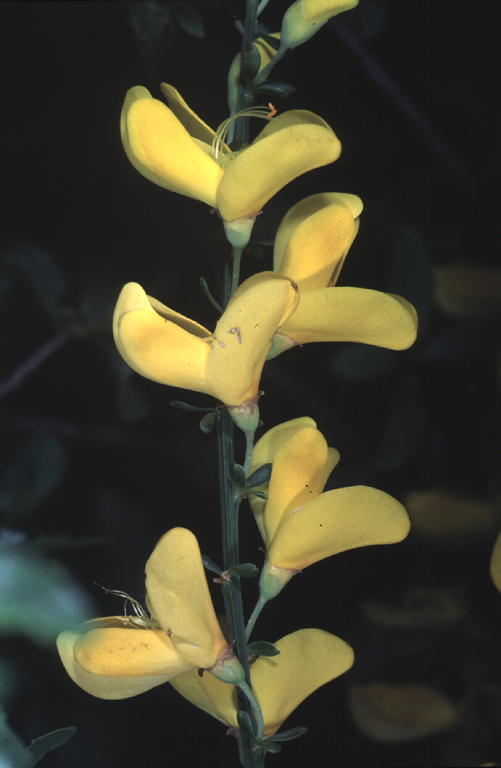 Sometimes confused with French broom (Genista monspessulana), which has pods with hairs all over them, stems that are not ridged or green. Native to Europe and North Africa. 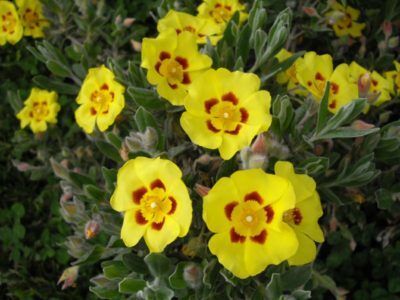 It was introduced to California in the 1850s as an ornamental in the Sierra Nevada foothills and was later used to prevent erosion and stabilize dunes. 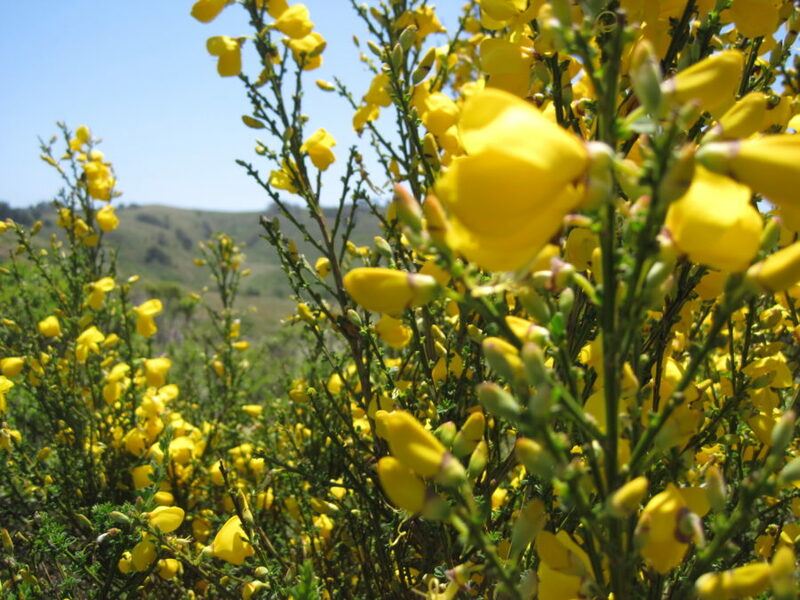 How does Scotch broom spread? Scotch broom spreads by prodigious seed production. 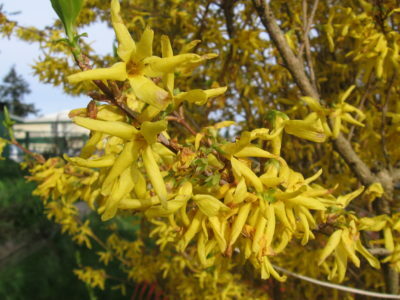 One medium-sized shrub can produce over 12,000 seeds a year. After ballistic dispersal, seeds can be further dispersed by ants, animals, or in mud clinging to road grading or maintenance machinery. Readily dispersed by rain wash on slopes. Can resprout from the root crown after cutting or freezing and sometimes after fire. 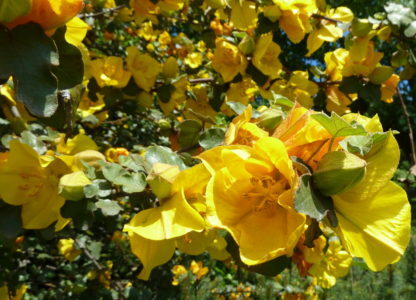 Where is Scotch broom found? Found along the California coast from Monterey north to the Oregon border and in the interior mountains of northern California on lower slopes. Prevalent in El Dorado, Nevada, and Placer counties in the Sierra Nevada foothills. Common in disturbed places, such as river banks, road cuts, and forest clearcuts, but can colonized undisturbed grassland, shrubland, an open canopy forests. Tolerates a wide range of soil moisture conditions. 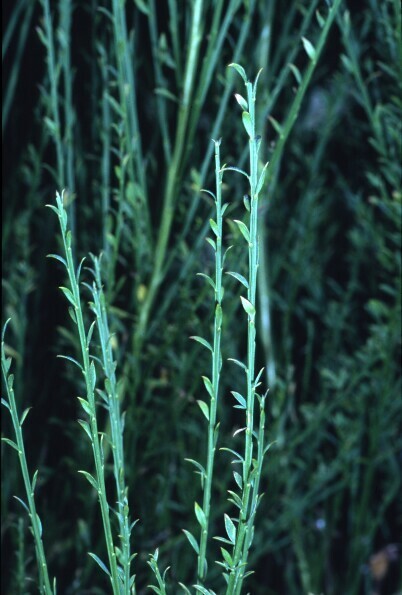 What problems does Scotch broom cause? 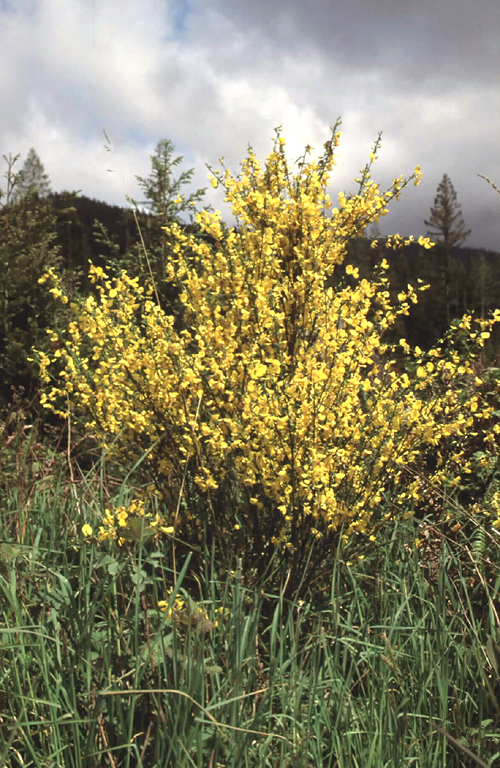 Scotch broom displaces native plants and forage species and makes reforestation difficult. 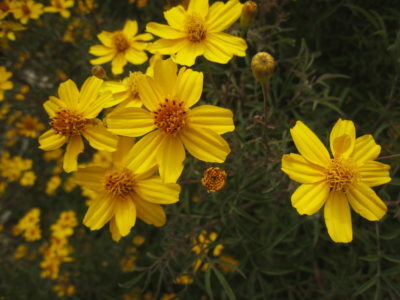 It is a strong competitor and can dominate a plant community, forming a dense monospecific stand. 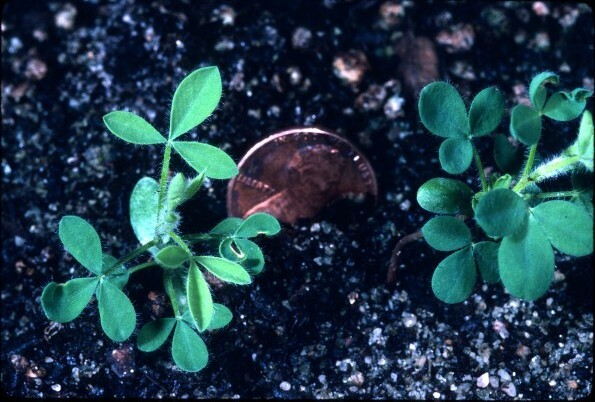 Mature shoots are unpalatable and cannot be used for forage except by rabbits in the seedling stage. Causes digestive disorders in horses. Shades out tree seedlings in areas that are revegetated after tree harvest. Scotch broom burns readily and carries fire to the tree canopy, increasing both the frequency and intensity of fires. Difficult to control because of its substantial and long-lived seedbank. The seedbank can build up to over 2000 seeds per square foot. 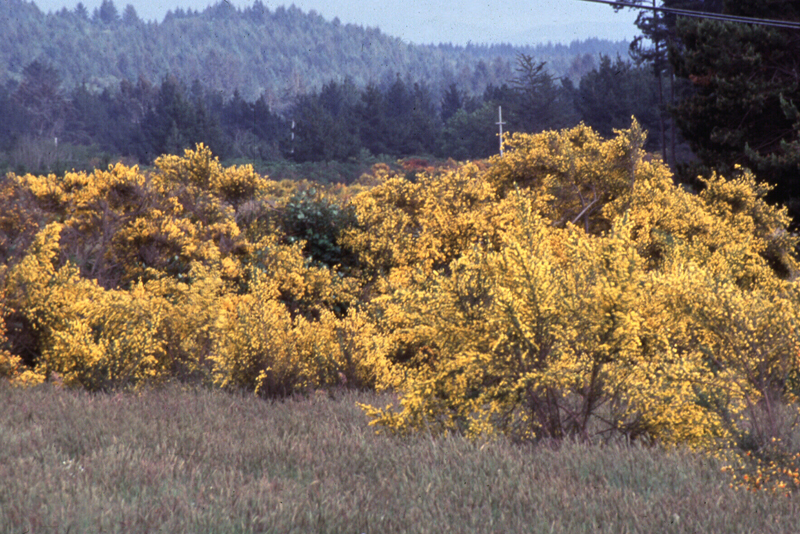 Scotch broom is host to nitrogen-fixing bacteria, which assists its establishment on poor and disturbed sites and its ability to outcompete native species. Its life span in California is longer than in its native range, living up to 17 years.